According to Commercial Observer, the most valuable commodity in Manhattan real estate isn’t square footage but natural light, and no one understands better than John Cetra, founder of CetraRuddy, how to balance the demands of residents with the tight space constraints imposed on architects. 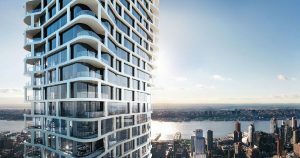 The firm’s design for ARO, the new collection of no-fee Midtown West apartments from Algin Management, maximizes exposure for each residence by giving the building itself a twist on the sides, opening up new sightlines and admitting the most light possible through its floor-to-ceiling windows. The facade is also designed with light in mind, with the white latticework of metal panels breaking up the otherwise sheer glass curtain.